Bengal maintained a firm grip in their 2nd Round Ranji Trophy clash against Uttar Pradesh at the Sawai Man Singh Stadium. Manoj Tiwary was the star of the show, as his brilliant century helped the team post 456, following which the bowlers restricted UP to 126-3 at Stumps on Day 2. Abhinav Mukund continued his extraordinary run of form with the bat on Day 2 of Tamil Nadu’s Round 2 meeting with Railways. Mukund led from the front with an unbeaten 98 as TN made a stunning comeback after being folded for just 121 in the first innings. They made 161-1 at Stumps on Day 2 with Mukund (98*) and Gandhi (41*) both at the crease. 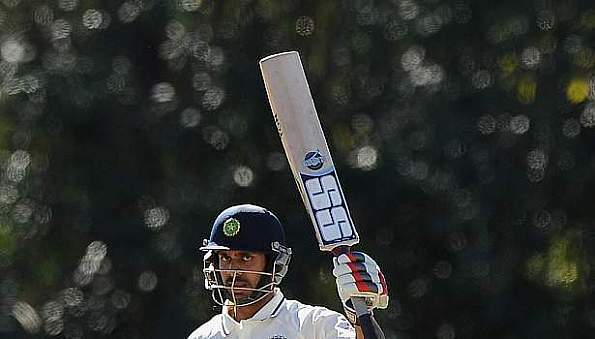 Akhil Herwardkar’s century (106) and Suryakumar Yadav’s half ton (54) helped Mumbai take a first innings lead against Baroda on the second day of their Round 2 clash at the Airforce Complex Ground in Delhi. Earlier in the day, Sagar Mangalorkar, who walked in at No. 11, scored an unbeaten 17 to take Baroda’s score to 305 after starting in 286 for 9. Punjab began Day 2 in disastrous fashion, losing seven wickets for the addition of just 31 more runs to their overnight total. They came back strong to regain control and currently hold a lead of 196 after Madhya Pradesh found themselves on the backfoot after losing half of their batting in reply to Punjab’s 378.